Temporary Tattoo Airbrush Kit with G34 Airbrush, Master Compressor TC-20, Air Hose, 100 Tattoo Stencils & 4 Custom Body Art Airbrush Tattoo Colors. User friendly & versatile airbrush! Includes Master's How-To-Airbrush Manual. Versatile system is ideal for multiple uses: hobbies, crafts, fine art, nail art, temporary tattoos, cake decorating, sunless tanning, cosmetics, auto-motorcycle graphics & more! 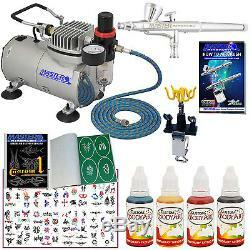 Professional Master Airbrush Temporary Tattoo Airbrushing System with User Friendly & Versatile Airbrush. Master Airbrush Model G34 Gravity Feed Airbrush and High Performance Master TC-20 Airbrush Compressor with air filter / pressure regulator. 4 Color Custom Body Art Temporary Tattoo Airbrush Paint Kit. Temporary Tattoo Stencils Booklet #1 with 100 Different Reusable Stencil Designs. Includes a Deluxe Airbrush Holder and Free How To Airbrush Guide. Master Airbrush Model G34 Airbrush Set. Master performance multi-purpose precision dual-action gravity feed airbrush with a 1/16 oz. Gravity fluid cup and a 0.3 mm needle & nozzle that allows you to spray from hairline up to 1 wide patterns. Master Airbrush Air Compressor Model TC-20. Professional high performance single-piston airbrush air compressor with air pressure regulator with gauge & water trap filter. 4 Color Custom Body Art Temporary Tattoo Paint Kit in 1 Ounce Bottles. The 4 most popular colors black, red, yellow and blue. Custom Body Art Self-Adhesive Reusable Temporary Tattoo Stencils Booklet #1 with 100 Different Stencil Designs (Poster for Display Purposes Only and is NOT included). Booklet #1 Contains 25 Pages with 4 Unique Tattoo Stencil Design Patterns on Each Page. Design sizes range from about 2" x 2" to 2.5" x 4". Designs Include: Animals: Butterflies, Bees, Spiders, Scorpions, Birds, Dolphins, Eagles, Turtles; People & Objects: Tribals, Skulls, Devils, Hearts, Rose, Flowers, Dragons. 6 Foot Braided Air Hose with 1/8 Fittings. Universal Clamp-On Airbrush Holder: Holds up to 4 airbrushes. How-To-Airbrush Manual & Guide Booklet by Master Airbrush. We are an Authorized dealer for all product lines that we sell. All Items we sell are brand new. If you wish to change an order or make an address change, it is best to call our customer service department immediately. If you have questions on how to do this, please message us first. Some of our locations are simply remote facilities and we do not have the ability to contact anyone there. We will always make your order right. All of our electronic items are rated for. It is the customer's responsibility for knowing the correct voltage requirement of their country. We reserve the right to select best option. UPS cannot deliver to P. Tracking information will be emailed once your items ships. UPS Ground is used within the lower 48 US States and Canada. If you select this option, be advised that if package is lost, stolen, or damaged, no claims can be filed. Paint Products and DVD's are excluded from this guarantee. Send back your return with a copy of the original order. Please allow up to 2 weeks for your return to be processed once it is received in our warehouse. Specific Product Return Exceptions: DVD's are non returnable. If defective or damaged they will only be replaced. Flammable or Hazardous Paint items: We must have picture documentation of damage sent or emailed to us on all paint related items in order to authorize a RGA number. This listing is currently undergoing maintenance, we apologise for any inconvenience caused. The item "Complete TEMPORARY TATTOO AIRBRUSH AIR COMPRESSOR KIT Body Art Paint Set Stencil" is in sale since Friday, April 19, 2013. This item is in the category "Health & Beauty\Tattoos & Body Art\Temporary Tattoos". The seller is "tcpglobal" and is located in Duncan, South Carolina. This item can be shipped to United States.